Triggering receptor expressed on myeloid cells (TREM)-1 is a cell surface molecule on neutrophils and monocytes/macrophages implicated in the amplification of inflammatory responses by enhancing degranulation and secretion of proinflammatory mediators. Macrophages play an important role in the intestinal mucosal immune system, because they are preferentially localized in the subepithelial region. Despite the presence of enormous numbers of bacteria in the colonic mucosa and the close proximity between mucosal macrophages and luminal bacteria, the intestinal mucosa normally displays minimal signs of inflammation. In this study, we show that the resident macrophage population in normal human small and large intestine contains only few TREM-1-expressing macrophages (<10%), whereas the overwhelming majority of monocytes (>90%) and macrophages from lymph nodes or tonsils (>80%) express TREM-1 on the cell surface. These findings were confirmed by FACS analysis and immunostainings of frozen tissue sections. The differential expression of TREM-1 greatly affects the functional capacities of monocytes and tissue macrophages. Although monocytes and macrophages from spleen, lymph nodes, or tonsils show a substantial increase in oxidative burst after TREM-1 cross-linking, no effect is seen in intestinal macrophages. Intriguingly, in contrast to monocytes, intestinal macrophages fail to up-regulate TREM-1 in response to TNF. This refractory state may be induced in intestinal macrophages by the local presence of IL-10 and TGF-β, because these two immunoregulatory cytokines synergistically down-regulate TREM-1 expression on monocytes in vitro. The absence of TREM-1 expression on lamina propria macrophages is likely to prevent excessive inflammatory reactions, and thus, excessive tissue damage in the intestine. The number of microorganisms present in the intestinal lumen exceeds by far the number of cells in the human body ( 1). However, it is not only the mass of the intestinal microflora, but also its antigenic complexity inherent to the >500 different commensal bacterial species ( 2) that makes it a major challenge for the intestinal immune system to maintain local tissue homeostasis ( 3). To cope with this massive antigenic load that may potentially get access to the intestinal lamina propria, several adaptations of the local immune system evolved that allow the constant surveillance of the large surface area of the intestinal mucosa without inducing immunopathological reactions ( 4). These adaptations include the preferential secretion of IgA ( 5) and its transport across the epithelial layer ( 6), but also the presence of several T cell subsets with immunoregulatory properties such as CD4 CD25 regulatory T cells ( 7), Tr1 cells, TCRγδ T cells ( 8, 9), or CD8αα TCRαβ intraepithelial cells ( 10, 11, 12, 13). A central function in the maintenance of tissue homeostasis can be ascribed to the cellular components of the innate immune system of the intestine, in particular to the macrophages ( 14, 15). Strategically located in the subepithelial area of the lamina propria, they efficiently phagocytose large numbers of luminal microorganisms that have crossed the epithelial barrier ( 16, 17). Despite the proximity of bacteria and bacterial LPS to intestinal macrophages in the normal intestinal mucosa, only low levels of inflammatory reactions are generally observed ( 18, 19). This may be attributed to several functional adaptations of the resident macrophages, such as absence of CD14 and CD89 expression and reduced (or even absent) expression of TLR-4 and TLR-2 ( 20). The triggering receptor expressed on myeloid cells-1 (TREM-1)3 was identified during the screening for DAP12-associated receptor proteins expressed on myeloid cells ( 21). TREM-1 is selectively expressed on the cell surface of neutrophils and subsets of monocytes and tissue macrophages ( 21). It contains only a short cytoplasmic tail, and thus signals upon association with DAP12, an ITAM motif-containing transmembrane adaptor protein ( 22). The natural ligand(s) of TREM-1 has not been identified yet; however, cross-linking of TREM-1 with agonistic Abs leads to the rapid and enhanced secretion of proinflammatory mediators such as IL-8, CCL2/MCP-1, and TNF from neutrophils and monocytes. This TREM-1-mediated release of proinflammatory cytokines is further potentiated upon priming of myeloid cells with LPS ( 21). Hence, TREM-1 can be regarded as an amplifier of inflammation in myeloid cells. In the present study, we compared the expression of TREM-1 in monocytes and macrophages from secondary lymphoid tissues with macrophages isolated from the human intestinal lamina propria. In contrast to monocytes and macrophages from secondary lymphoid organs, intestinal macrophages from small and large bowel generally do not express TREM-1 on their surface, as assessed by FACS stainings. Consequently, cross-linking of TREM-1 does not enhance oxidative burst in intestinal macrophages. Intriguingly, in contrast to monocytes, intestinal macrophages fail to induce TREM-1 cell surface expression upon stimulation with LPS, TNF, or PMA. The observed absence of TREM-1 expression on intestinal macrophages may be related to the action of IL-10 and TGF-β because these immunomodulatory cytokines were found to synergistically inhibit TREM-1 up-regulation on monocytes. The absence of TREM-1 cell surface expression on intestinal macrophages can be thus regarded as a further adaptation of resident intestinal macrophages to the specific environment of the intestinal lamina propria. Fluorochrome-conjugated mAb against CD14 (TUK4; Serotec), CD33 (WM53; BD Pharmingen), HLA-DR (LN3; eBioscience), CD89 (A59; BD Pharmingen), and CD45 (HI30; BD Pharmingen) were used for FACS stainings. Supernatant of the human TREM-1-specific hybridoma 21C7 and, as a second step, FITC-conjugated goat anti-mouse IgG (Sigma-Aldrich) was used for flow cytometric detection of TREM-1. Isotype controls with irrelevant specificities were included as negative controls. Cells were preincubated for 15 min in Octagam (Novartis Pharmaceuticals), diluted 1/2 in PBS, to block FcRs and unspecific binding. Cells were then stained for 20 min on ice, with the specific Abs diluted in PBS/5% horse serum. After staining, cells were resuspended and fixed in 1% buffered paraformaldehyde, and at least 105 events were acquired on a FACScan (BD Biosciences) for subsequent analysis using CellQuest software (BD Biosciences). For the purification of monocytes, we used anti-CD14 MicroBeads (Miltenyi Biotec), and performed a positive MACS procedure, according to the manufacturer’s recommendations. To enrich for intestinal macrophages, a depleting MACS procedure was used with mAbs against CD19 (HIB19; BD Pharmingen), CD22 (HIB22; BD Pharmingen), CD3 (OKT3, purified hybridoma supernatant), CD34 (QBEnd10; DakoCytomation), and HEA-125 (Ber-EP4; DakoCytomation), and anti-mouse IgG MACS beads (Miltenyi Biotec). Cells were first incubated for 15 min in Octagam (Novartis Pharmaceuticals), diluted 1/2 in PBS, followed by an incubation with the primary Abs for 15 min on ice. After washing twice, cells were incubated for 30 min at 4°C with the secondary reagent and washed twice before subjecting cells to the MACS procedure, according to the manufacturer’s recommendations. Inguinal lymph nodes were obtained from two female patients (ages 67 and 50 years) with suspected non-Hodgkin lymphoma. Histologically, in the lymph nodes used, no signs of malignant cells were found. A splenic tissue sample was obtained following splenectomy of a 67-year-old female patient with low-grade B cell lymphoma. Resected colon specimens were obtained from four patients with colon cancer (two female and two male patients with a mean age of 72 years; range, 58–84 years), four patients with diverticulitis (three female and one male patient with a mean age of 68 years; range, 58–78 years), and one male patient (26 years old) with an ileus. Small intestinal tissue samples were from three patients with diverticulitis (three male patients with a mean age of 50 years; range, 43–56 years), one patient with an ileus (one male patient, 67 years old), one patient who had small intestinal fistula (one male patient, 37 years old), and one patient who underwent surgery for dolichocolon (female, 58 years old). Tissue specimens were obtained according to institutional guidelines. The specimens were taken at the furthest distance from the macroscopically found pathology, close to the resectional line in a healthy bowel area, and the absence of histopathological signs of inflammation or neoplasia was confirmed by the assessment of H&E-stained sections from paraffin-embedded tissue samples adjacent to the tissue samples used for cell isolation. Serial frozen tissue sections (5 μm) were fixed with acetone, rehydrated in TBS/1% BSA/1% Octagam (Novartis Pharmaceuticals) for 10 min, and incubated for 30 min with the primary Abs diluted in TBS/1% BSA. The following primary mAb were used: anti-CD68 (EMB11; DakoCytomation), anti-CD15 (Leu-M1; BD Pharmingen), and supernatant of mouse anti-human TREM-1 hybridoma (17A11, 42A7 ( 23)). After rinsing, slides were incubated with the biotinylated rabbit anti-mouse IgG (E 354; DakoCytomation), followed by an incubation step with the ABComplex-AP (DakoCytomation). After rinsing, slides were incubated for 30 min in the dark in freshly prepared substrate solution (Naphtol-As-Biphosphate, new fuchsin), according to the manufacturer’s recommendations. Slides were counterstained for 1 min in hematoxylin. Frozen tissue sections were fixed and rehydrated, as described for immunohistochemical stainings. The following primary mAbs were used: biotinylated anti-pan-human neutrophilic peptide (HNP1–3; clone D21; HyCult Biotechnology), anti-CD68-R-PE (clone Y1/82A; BD Pharmingen), and supernatant of the mouse anti-human TREM-1 hybridoma (17A11, 42A7 ( 23)). As secondary reagent, an anti-mouse Ig-Alexa 488 conjugate (Molecular Probes) and PE-conjugated streptavidin (eBioscience) were used for TREM-1 and neutrophil-specific HNP1–3 staining, respectively. Peripheral blood monocytes were isolated from buffy coat preparations of healthy donors by Ficoll/Hypaque density gradient centrifugation to get rid of erythrocytes and granulocytes. Monocytes in the interphase were further purified using CD14 MicroBeads (Miltenyi Biotec). Intestinal macrophages were isolated from surgical specimens of normal colon, and of normal small intestine obtained from patients undergoing surgery. The epithelium was first removed by incubating small pieces of intestinal mucosa in 5 mM EDTA/2 mM DTT at 37°C for 30 min. To dissociate lamina propria cells, tissues were treated with 200 U/ml collagenase (type IV; Sigma-Aldrich)/50 U/ml DNase (type I, grade II; Roche) at 37°C for 5 × 30 min. The lamina propria cell fraction was subsequently subjected to 24/50% Percoll density gradient centrifugation in which erythrocytes, granulocytes, and small lymphocytes are subsequently found in the pellet and most of the epithelial cells in the top layer of the gradient. The macrophage-enriched interphase was further purified using a depleting MACS procedure. Spleen and lymph node macrophages were isolated by dissociating tissue pieces between frosted microscopy slides, followed by enzymatic digestion of the remaining tissue with 200 U/ml collagenase (type IV; Sigma-Aldrich)/50 U/ml DNase (type I, grade II; Roche) at 37°C for 3 × 30 min. After hypotonic lysis of erythrocytes, the cells were subjected to Ficoll/Hypaque density gradient centrifugation to remove dead cells. As a control, monocytes were subjected to the same experimental conditions as intestinal macrophages or lymph node macrophages during the entire isolation and fractionation procedure. These isolation steps, however, did not substantially influence cell surface expression of CD14, CD33, HLA-DR, CD45, CD89, and TREM-1 (data not shown). Monocyte/macrophage-enriched cell populations were resuspended at 1–2 × 106 cells/ml for subsequent cell culture. To assess LPS-, TNF-, and PMA-mediated up-regulation of TREM-1, cells were cultured in the presence or absence of 1 μg/ml LPS (Sigma-Aldrich), TNF (104 U/ml; PeproTech), or PMA (20 ng/ml; Sigma-Aldrich) as a positive control, or were left untreated. Kinetics experiments indicated that TREM-1 expression on monocytes/macrophages is maximal at 16–20 h poststimulation (data not shown). Hence, cells were analyzed after a 16- to 20-h culture period for TREM-1 expression by FACS. For the assessment of their modulatory effects on TREM-1 expression, TGF-β (5 ng/ml; eBioscience) and/or IL-10 (10 ng/ml; PeproTech) were added to cultures of monocytes and tissue macrophages for 20 h. Thereafter, IL-10/TGF-β-treated cell cultures were treated with LPS or TNF, as described above, for further 20 h. The statistical significance of the data was analyzed using a paired two-tailed Student’s t test. For all analyses, p values <0.05 were considered statistically significant. The protocol described previously ( 24) was followed with minor modifications. Dihydrorhodamine 123 (DHR-123; Molecular Probes) was used as a peroxidase substrate to measure oxidative burst on the FACS. Purified monocytes/macrophages were first incubated for 15 min on ice in Octagam (diluted 1/2 in PBS) and then either incubated with anti-TREM-1 (21C7) mAb or an isotype-matched control Ab for 15 min on ice. Cells were subsequently stimulated for 30 min at 37°C either by cross-linking TREM-1 with a goat anti-mouse IgG antiserum (DakoCytomation), and/or incubating with TNF (104U/ml), PMA (8 μg/ml; Sigma-Aldrich), or dexamethasone (100 nM; Alexis Biochemicals), respectively. Cells were incubated for 10 min at 37°C in the dark with DHR-123 (4 μg/ml) and immediately used for FACS analysis. Lamina propria macrophages were first cultured for 4 h after isolation before measuring the induction of oxidative burst, as control experiments showed a transiently increased basal level of oxidative burst directly after the isolation procedure (data not shown). The percentage of macrophages was determined by FACS stainings for CD33 and HLA-DR using an analysis gate set to include intact cells on a forward light scatter (FSC) vs right angle scatter (SSC) dot plot. Backgating on CD33+ HLA-DR+ cells in control stainings was used to identify the correct position of the macrophages in the FSC vs SSC dot plots for the flow cytometric analysis of the oxidative burst. For the comparative analysis of TREM-1 expression on monocytes, macrophages isolated from secondary lymphoid organs, and the intestinal mucosa, we first determined the phenotypic composition of the monocyte/macrophage-enriched cell suspensions obtained from the distinct compartments. Purified monocyte populations generally contained ∼95% CD14-positive cells (Fig. 1⇓). The CD14-positive monocytes always coexpressed CD33 (data not shown). Most of these CD14 and CD33 double-positive monocytes (>90%) reproducibly expressed substantial levels of TREM-1 on their cell surface. Absence of TREM-1, CD14, and CD89 expression on intestinal lamina propria macrophages. Intestinal lamina propria macrophages, monocytes, and macrophages from lymph nodes were analyzed for TREM-1, CD14, CD89, HLA-DR, and CD33 cell surface expression by flow cytometry. Gates were set for monocytes/macrophages in FSC/SSC dot blots, upon backgating on CD33+ cells. The monocyte and lamina propria macrophage FACS profile is representative of cells from seven donors, and the lymph node macrophage profile is representative of cells from two tissue donors. Frequencies of isotype control-positive cells (always <2%) were subtracted from the values obtained with the experimental stainings to obtain the frequencies indicated in the respective quadrants. Cell suspensions obtained from lymph nodes generally contained between 10 and 20% CD14-positive macrophages that always coexpressed HLA-DR and CD33. TREM-1 was expressed on 80–90% of these lymph node-derived macrophage subsets (Fig. 1⇑). The frequency of CD14-positive macrophages was generally lower in tonsils than in lymph nodes. The frequency of CD14-positive tonsillar macrophages coexpressing TREM-1 on the cell surface, however, was comparable to those in lymph nodes (data not shown). For the identification of intestinal macrophages, other markers than CD14 need to be used because they mostly lack CD14 cell surface expression. Hence, double stainings for CD33 and HLA-DR were used to define intestinal lamina propria macrophages following fractionation on a Percoll gradient. In the 24/50% interphase, after a negative MACS sort, ∼60–70% of the cells represented CD33- and HLA-DR-coexpressing macrophages. A minor fraction (∼5–10%) of these macrophages expressed CD14. Expression levels of CD14 on these intestinal macrophages, however, were generally lower than in monocytes or in macrophages isolated from secondary lymphoid tissues (Fig. 1⇑). Intriguingly, TREM-1 was not detectable on the cell surface of most intestinal macrophages, and the fraction of TREM-1-expressing CD33- and HLA-DR-positive macrophages was always <10%. TREM-1-expressing intestinal macrophages were almost exclusively contained within the small subset of CD14-positive macrophages. However, also in the CD14-positive subset of intestinal macrophages, a substantial fraction of macrophages lacked TREM-1 expression. Intestinal macrophages have been previously reported to be not only mostly negative for CD14, but also for CD89, i.e., the FcR for IgA. Hence, we also compared TREM-1 and CD89 expression on intestinal macrophages. As shown in Fig. 1⇑, expression of TREM-1 on intestinal macrophages correlates with CD89 cell surface expression. To rule out the possibility that the absence of TREM-1 surface expression was due to the isolation procedure required to obtain intestinal lamina propria macrophages, we performed immunohistochemical stainings of intestinal tissue sections. We compared the frequency of intestinal macrophages detected by mAb against the cytoplasmic CD68 Ag, with the frequency of TREM-1-positive cells on cryostat sections of normal small intestine and normal colonic mucosa. As shown in Fig. 2⇓A, numerous CD68-positive cells are detected in the lamina propria of large and small bowel. TREM-1-expressing cells, however, were only rarely detected. This was in contrast to sections from secondary lymphoid organs, in which TREM-1-positive cells were readily detected, often at comparable sites as CD68-positive macrophages on serial sections. The results of these immunostainings were confirmed by FACS stainings using neutrophil-depleted, macrophage-enriched cell suspensions isolated from samples adjacent to the tissues used for the preparation of the tissue sections (Fig. 2⇓B). 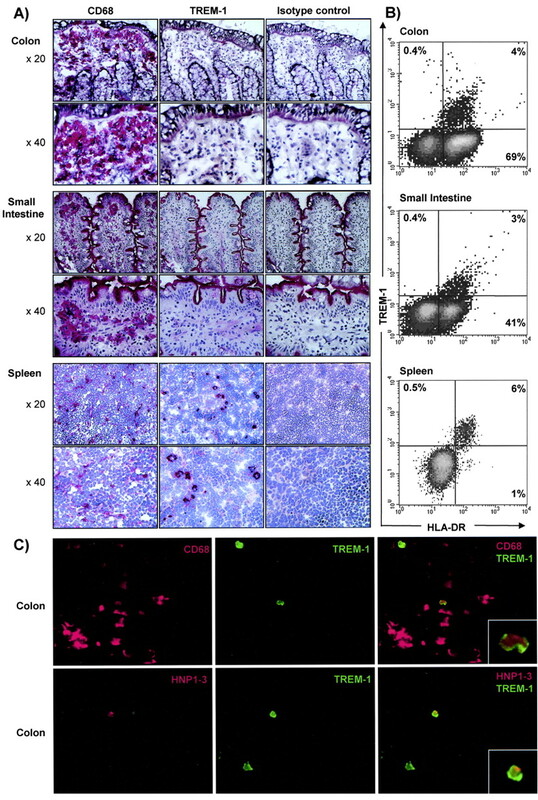 To directly determine the phenotype of TREM-1-positive cells in the intestinal mucosa, immunofluorescence stainings for TREM-1 in combination with stainings for CD68, and neutrophil-specific defensins HNP1–3 were conducted. As shown in Fig. 2⇓C, the few TREM-1-positive cells present in the intestinal mucosa are mostly CD68+ macrophages, although few HNP1–3-positive neutrophils are occasionally found in normal intestinal lamina propria that may also express TREM-1. Intestinal macrophages generally lack TREM-1 expression. Serial sections of normal colon, normal small intestine, and spleen were analyzed in parallel by immunohistochemistry for TREM-1- and CD68-expressing cells. An isotype-matched irrelevant mAb was used as an isotype control (A). Cell surface expression of TREM-1 from adjacent tissue samples was analyzed by FACS stainings (B). Stainings are representative for >12 independent intestinal samples, and for one splenic tissue sample analyzed. Double immunofluorescence stainings demonstrate that the few TREM-1-expressing cells in the intestinal lamina propria are mainly CD68+ macrophages and occasionally defensin HNP1–3-expressing neutrophils, rarely found in the normal intestinal mucosa (C). TREM-1 has been previously found to be readily induced in monocytes upon addition of LPS ( 21, 23). As shown in Fig. 3⇓, this is also true for macrophages obtained from secondary lymphoid organs, treated with LPS. Following stimulation in vitro with LPS, TREM-1 surface expression on monocytes/macrophages peaked at ∼16- to 20-h postactivation (Fig. 3⇓, data not shown). Stimulation of macrophages isolated from the intestinal lamina propria with LPS, however, did not lead to an enhanced TREM-1 cell surface expression (Fig. 3⇓A). Because intestinal macrophages generally lack expression of CD14 (Fig. 1⇑) and TLR-4 ( 20), this might be attributed to the absence of LPS-binding receptors on intestinal macrophages. Hence, we stimulated monocytes, macrophages from secondary lymphoid organs, and from intestinal lamina propria with TNF. Stimulation of monocytes and macrophages from lymph nodes and spleen leads to a dose-dependent increase of TREM-1. Intestinal macrophages, however, were refractory to TNF-induced TREM-1 expression (Fig. 3⇓) and showed no signs of TREM-1 induction even after prolonged stimulation with TNF in vitro (data not shown). Intriguingly, even in the presence of PMA, which also stimulates intestinal macrophages, no TREM-1 up-regulation was observed in intestinal lamina propria macrophages (Fig. 3⇓). TREM-1 expression is up-regulated by LPS, TNF, or PMA on monocytes, but not intestinal macrophages. TREM-1 is strongly up-regulated on monocytes (A) and splenic macrophages (B) after incubation with LPS, TNF, or PMA, but not on intestinal macrophages (C). 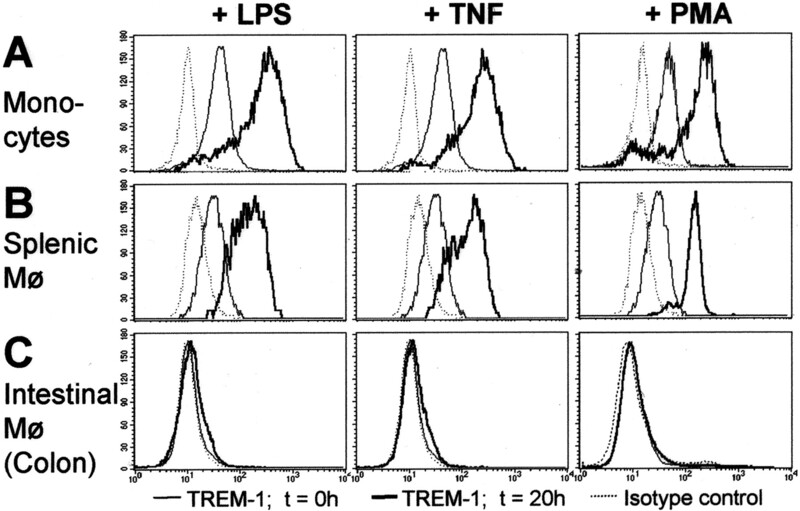 Stimulated cells after 20 h (filled bold line) and nonstimulated cells after isolation (filled line) were analyzed for cell surface expression of TREM-1. Dashed lines indicate background staining of stimulated cells with an isotype-matched irrelevant Ab. CD33+ cells within the monocyte/macrophage gate of the FSC/SSC dot plot were used for analysis. Experiment was repeated six times for monocytes and intestinal macrophages and once for splenic macrophages. The microenvironment of the intestinal lamina propria is characterized by the presence of the anti-inflammatory cytokines IL-10 and TGF-β produced by regulatory T cells, but also activated macrophages, dendritic cells, B cells, and even epithelial cells. Hence, we assessed how the local presence of TGF-β and IL-10 might affect the induction of cell surface expression of TREM-1. After 20- and 40-h culture of monocytes in the presence of TGF-β and/or IL-10, TREM-1 expression levels were substantially reduced compared with untreated cells, showing a synergistic effect of TGF-β and IL-10 (Fig. 4⇓A). Monocytes, stimulated with TNF after a 20-h preincubation period with TGF-β and/or IL-10, again revealed the synergistic inhibition of TREM-1 up-regulation by TGF-β and IL-10 (Fig. 4⇓A). In the presence of these two immunoregulatory cytokines, even TREM-1 induction by, i.e., LPS, an even more potent inducer of TREM-1 up-regulation in monocytes, is significantly inhibited (Fig. 4⇓A). Intriguingly, such a synergistic down-regulation by IL-10 and TGF-β is also observed for cell surface expression of the FcαR (CD89) on monocytes (Fig. 4⇓B). TGF-β and IL-10 synergistically inhibit TREM-1 up-regulation on human monocytes. 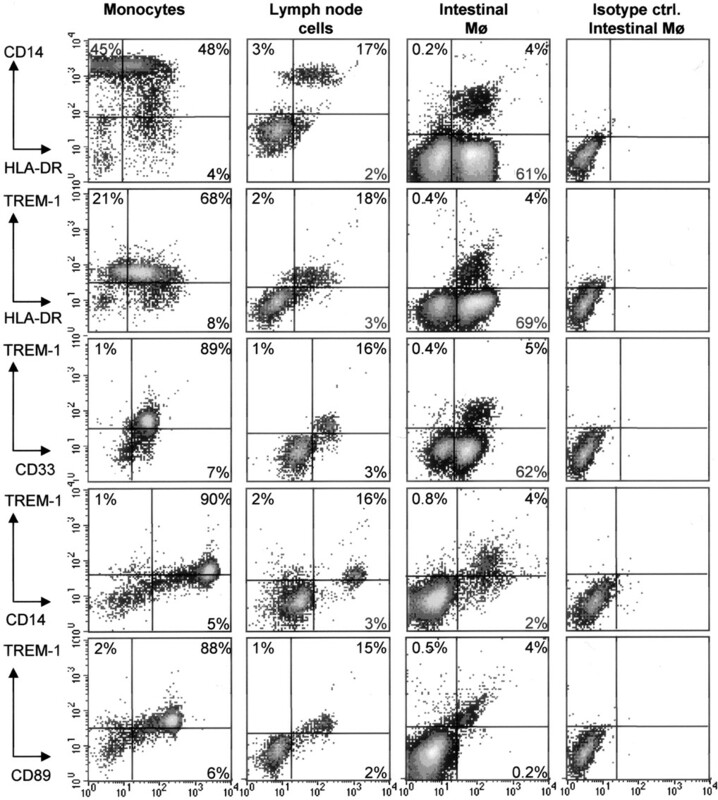 Primary monocytes cultured in the presence, or absence, of TGF-β and/or IL-10 over a period of 20, 40, or 40 h with the addition of TNF or LPS after 20 h were analyzed for cell surface expression of TREM-1 (A) and CD89 (B) by flow cytometry. Results are expressed as mean fluorescence intensity (MFI) values defined as the mean of six independent experiments (maximum MFI of monocytes at 20 h = 100). All data are indicated as mean ± SEM; n = 6. ∗, p < 0.05. To confirm the absence of TREM-1 on intestinal macrophages also on a functional level, we assessed the extent of oxidative burst induction in these cells upon engagement of TREM-1. Because the ligands for TREM-1 have not been characterized yet, we cross-linked TREM-1 on the cell surface of freshly isolated cells with an agonistic anti TREM-1 Ab and measured the intracellular formation of the reactive oxidants superoxide anions and hydrogen peroxide indirectly by fluorochrome formation using DHR-123. 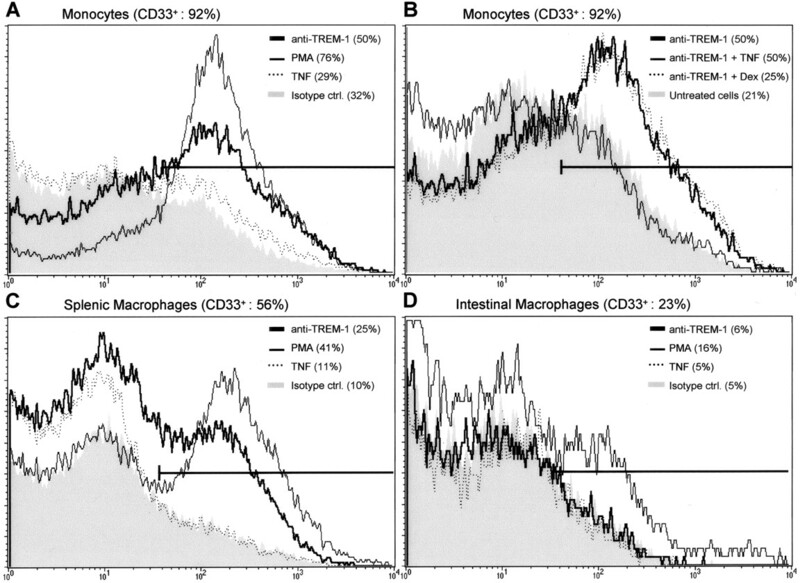 The monocyte/macrophage gate set in the FSC vs SSC dot plot contained >90% CD33-positive cells when applied to monocytes, >50% CD33+ cells when cells enriched for splenic macrophages were analyzed, and generally >20% CD33+ cells in the intestinal macrophage-enriched Percoll fraction. Cross-linking of TREM-1 on monocytes showed a significant induction of oxidative burst compared with the isotype-matched primary Ab and the same secondary Ab as used for engagement of TREM-1. 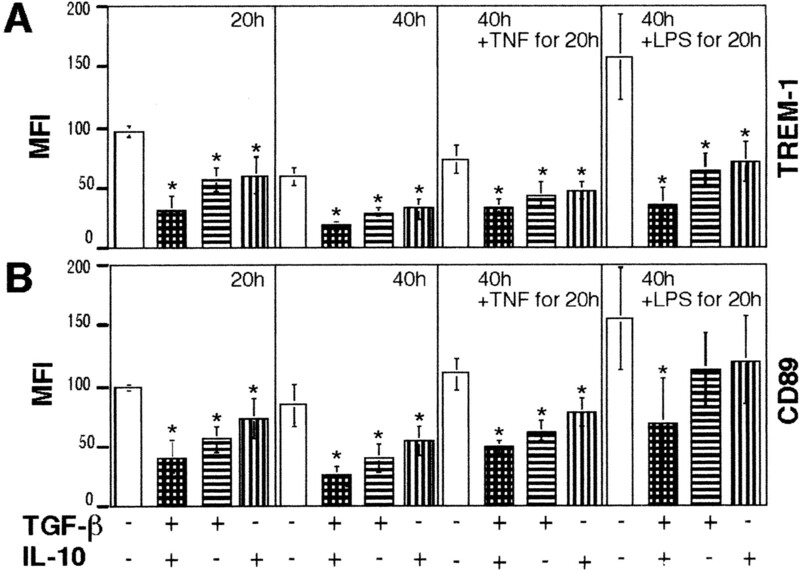 TNF did not induce any oxidative burst within 30 min (Fig. 5⇓A), and also when administered with simultaneous TREM-1 cross-linking, no synergistic effect was found. Intriguingly, the TREM-1-mediated induction of oxidative burst in monocytes was inhibited by the addition of the synthetic glucocorticoid dexamethasone. Splenic macrophages revealed a comparable TREM-1-mediated induction of oxidative burst. However, in intestinal macrophages, no sign of oxidative burst induction was seen upon cross-linking of TREM-1, although PMA was clearly able to induce an oxidative burst in ∼70% of the macrophages present (Fig. 5⇓). Cross-linking of TREM-1 induces oxidative burst in peripheral blood monocytes and splenic macrophages, but not in intestinal macrophages. PBMC (A and B), splenic macrophages (C), and intestinal macrophages (D) were assessed for the induction of oxidative burst, as described in Materials and Methods. Cells were either stimulated by cross-linking TREM-1 (anti-TREM-1; filled bold line) or by adding PMA (filled line), TNF (A, C, and D, dotted line), or Dex (B, filled line). An isotype-matched mAb (A, C, and D, shaded) or untreated cells (B, shaded) were used as a negative control. The percentage of CD33 monocytes/macrophages in the respective cell populations used for analysis is indicated. One representative example of 12 independent experiments is shown for monocytes and intestinal macrophages, and one for splenic macrophages. In the normal intestinal mucosa, macrophages represent the major APC population, where they exert a key role in determining the local immune response to commensal microbes that may enter the intestinal mucosa from the gut lumen ( 25). Strategically located in the periepithelial area of the lamina propria, they are enabled to phagocytose and degrade lumen-derived microbes, but also apoptotic cells. In their cell surface phenotype, intestinal macrophages differ substantially from most macrophages of secondary lymphoid organs or monocytes because they reportedly lack surface expression of TLR2 and TLR4 ( 20), i.e., the central component of the LPS receptor ( 26), and also CD89, i.e., the receptor for IgA (FcαR) ( 27). Accordingly, the resident intestinal lamina propria macrophages seem to be refractory to the induction of acute inflammatory responses ( 28). Recently, the role of TREM-1 in neutrophil effector functions was assessed, and TREM-1-mediated activation was identified as a strong and immediate stimulus of degranulation, respiratory burst, and, to a lesser extent, phagocytosis in neutrophils ( 29). In macrophages, TREM-1-mediated activation leads to an enhanced synthesis and secretion of proinflammatory mediators ( 21), to an up-regulation of several surface markers, and, as confirmed also in this study, to an induction of oxidative burst (Fig. 5⇑). Hence, TREM-1-mediated signaling can substantially amplify inflammatory reactions ( 30). Although the natural ligand(s) for TREM-1 has not been characterized yet, the beneficial effects seen in a mouse model of septic shock upon treatment in vivo with a blocking TREM-1 fusion protein clearly document the importance of TREM-1-mediated activation in acute inflammatory responses ( 23). Subsequent findings suggested an involvement of TREM-1 also in more chronic inflammatory effects such as hepatic granuloma formation ( 31). The absence of TREM-1 expression on most intestinal macrophages has been verified in our study also by a series of control experiments. In particular, monocytes were subjected to the same experimental conditions as intestinal macrophages during the entire isolation and fractionation procedure. These isolation steps, however, did not influence cell surface expression of TREM-1 on monocytes (data not shown). TREM-1 appears to be also down-regulated on a transcriptional level because in contrast to tonsils or peripheral blood, we could not detect significant numbers of TREM-1-expressing cells by in situ hybridization of intestinal tissue sections (data not shown). Absence of TREM-1 expression on intestinal macrophages correlates with absence of both CD14 and CD89. Hence, the small subset of TREM-1-positive CD33 macrophages isolated from the intestinal lamina propria might represent recently recruited monocytes known to coexpress CD14 and CD89. Under the influence of the regulatory cytokines IL-10 and TGF-β, recruited monocytes may subsequently down-regulate TREM-1 surface expression in the intestinal mucosa, as indicated by our finding of a synergistic effect of IL-10 and TGF-β on TREM-1 expression on monocytes in vitro (Fig. 4⇑). A similar synergistic effect of IL-10 and TGF-β has been previously noted for down-modulation of CD89 on monocytes ( 27, 32). When we compared the frequency of TREM-1-positive CD14-positive macrophages in secondary lymphoid tissues, we consistently found a small subset of TREM-1-negative macrophages in these organs. Immunohistochemical stainings revealed that the follicular macrophages that coexpress CD14 and CD68 indeed completely lack TREM-1 expression. This differential staining pattern indicates that TREM-1 expression may allow to distinguish functionally diverse macrophage subpopulations. The observed absence of TREM-1 expression on intestinal macrophages of the large and small bowel in humans can be regarded as a further functional adaptation to the Ag-rich environment to prevent excessive inflammatory reactions in the normal intestine. The reduced oxidative burst seen in intestinal macrophages after TREM-1 cross-linking when compared with macrophages from spleen or lymph nodes (data not shown) or with monocytes demonstrates that this down-modulation greatly affects their effector functions (Fig. 5⇑). In conclusion, the present results clearly demonstrate that macrophages isolated from normal intestinal mucosa generally lack expression of TREM-1. The absence of TREM-1 expression may be due to the specific microenvironment of the intestinal mucosa. The observed down-modulation of TREM-1 on monocytes when cultured in the presence of IL-10 and TGF-β clearly supports this notion. Intriguingly, intestinal macrophages are also refractory to the TREM-1-inducing effects of TNF and PMA. Hence, TREM-1-mediated amplification of inflammatory reactions and oxidative burst is generally not observed in intestinal lamina propria macrophages under physiological conditions. Although a previous initial analysis of TREM-1 expression in a limited number of colon biopsies from patients with ulcerative colitis revealed no indication for an increased frequency of TREM-1-expressing cells in patients with active ulcerative colitis, it remains to be seen whether this applies to the entire spectrum of inflammatory bowel diseases (ulcerative colitis, Crohn’s disease) during all stages of the disease. We thank T. Brunner, S. Rihs, S. Jakob, and A. J. S. Macpherson for helpful discussions. ↵1 This work was supported by Grant 31-65307.01 from the Swiss National Science Foundation (to C.M.) and the Helmut Horten-Stiftung. ↵3 Abbreviations used in this paper: TREM, triggering receptor expressed on myeloid cells; DHR-123, dihydrorhodamine 123; FSC, forward light scatter; HNP, human neutrophilic peptide; SSC, right angle scatter. Brandtzaeg, P.. 1989. Overview of the mucosal immune system. Curr. Top. Microbiol. Immunol. 146:13. Mai, V., J. G. Morris, Jr, V. Braesco. 2004. Colonic bacterial flora: changing understandings in the molecular age. J. Nutr. 134:459. Elson, C. O.. 2000. Commensal bacteria as targets in Crohn’s disease. Gastroenterology 119:254. Abreu-Martin, M. T., S. R. Targan. 1996. Regulation of immune responses of the intestinal mucosa. Crit. Rev. Immunol. 16:277. Fuhrman, J. A., J. J. Cebra. 1981. Special features of the priming process for a secretory IgA response: B cell priming with cholera toxin. J. Exp. Med. 153:534. Kaetzel, C. S., J. K. Robinson, K. R. Chintalacharuvu, J. P. Vaerman, M. E. Lamm. 1991. The polymeric immunoglobulin receptor (secretory component) mediates transport of immune complexes across epithelial cells: a local defense function for IgA. Proc. Natl. Acad. Sci. USA 88:8796. Roberts, S. J., A. L. Smith, A. B. West, L. Wen, R. C. Findly, M. J. Owen, A. C. Hayday. 1996. T-cell αβ+ and γδ+ deficient mice display abnormal but distinct phenotypes toward a natural, widespread infection of the intestinal epithelium. Proc. Natl. Acad. Sci. USA 93:11774. Modlin, R. L., C. Pirmez, F. M. Hofman, V. Torigian, K. Uyemura, T. H. Rea, B. R. Bloom, M. B. Brenner. 1989. Lymphocytes bearing antigen-specific γδ T-cell receptors accumulate in human infectious disease lesions. Nature 339:544. Shires, J., E. Theodoridis, A. C. Hayday. 2001. Biological insights into TCRγδ+ and TCRαβ+ intraepithelial lymphocytes provided by serial analysis of gene expression (SAGE). Immunity 15:419. Poussier, P., T. Ning, D. Banerjee, M. Julius. 2002. A unique subset of self-specific intraintestinal T cells maintains gut integrity. J. Exp. Med. 195:1491. Guy-Grand, D., C. Griscelli, P. Vassalli. 1978. The mouse gut T lymphocyte, a novel type of T cell: nature, origin, and traffic in mice in normal and graft-versus-host conditions. J. Exp. Med. 148:1661. Saurer, L., I. Seibold, S. Rihs, C. Vallan, T. Dumrese, C. Mueller. 2004. Virus-induced activation of self-specific TCRαβ CD8αα intraepithelial lymphocytes does not abolish their self-tolerance in the intestine. J. Immunol. 172:4176. Bull, D. M., M. A. Bookman, C. S. Kaetzel, J. K. Robinson, K. R. Chintalacharuvu, J. P. Vaerman, M. E. Lamm. 1977. Isolation and functional characterization of human intestinal mucosal lymphoid cells. J. Clin. Invest. 59:966. Golder, J. P., W. F. Doe. 1983. Isolation and preliminary characterization of human intestinal macrophages. Gastroenterology 84:795. Bockman, D. E., W. R. Boydston, D. H. Beezhold. 1983. The role of epithelial cells in gut-associated immune reactivity. Ann. NY Acad. Sci. 409:129. Sansonetti, P., V. Braesco. 2001. Phagocytosis of bacterial pathogens: implications in the host response. Semin. Immunol. 13:381. Kanai, T., R. Ilyama, T. Ishikura, K. Uraushihara, T. Totsuka, M. Yamazaki, T. Nakamuma, M. Watanabe, V. Braesco. 2002. Role of the innate immune system in the development of chronic colitis. J. Gastroenterol. 37:(Suppl. 14):38. Bourlioux, P., B. Koletzko, F. Guarner, V. Braesco. 2003. The intestine and its microflora are partners for the protection of the host: report on the Danone Symposium “The Intelligent Intestine,” held in Paris, June 14, 2002. Am. J. Clin. Nutr. 78:675. Hausmann, M., S. Kiessling, S. Mestermann, G. Webb, T. Spottl, T. Andus, J. Scholmerich, H. Herfarth, K. Ray, W. Falk, G. Rogler. 2002. Toll-like receptors 2 and 4 are up-regulated during intestinal inflammation. Gastroenterology 122:1987. Bouchon, A., J. Dietrich, M. Colonna. 2000. Cutting edge: inflammatory responses can be triggered by TREM-1, a novel receptor expressed on neutrophils and monocytes. J. Immunol. 164:4991. Colonna, M.. 2003. DAP12 signaling: from immune cells to bone modeling and brain myelination. J. Clin. Invest. 111:313. Bouchon, A., F. Facchetti, M. A. Weigand, M. Colonna. 2001. TREM-1 amplifies inflammation and is a crucial mediator of septic shock. Nature 410:1103. Emmendorffer, A., M. Hecht, M. L. Lohmann-Matthes, J. Roesler. 1990. A fast and easy method to determine the production of reactive oxygen intermediates by human and murine phagocytes using dihydrorhodamine 123. J. Immunol. Methods 131:269. Rogler, G., M. Hausmann, D. Vogl, E. Aschenbrenner, T. Andus, W. Falk, R. Andreesen, J. Scholmerich, V. Gross. 1998. Isolation and phenotypic characterization of colonic macrophages. Clin. Exp. Immunol. 112:205. Smith, P. D., L. E. Smythies, M. Mosteller-Barnum, D. A. Sibley, M. W. Russell, M. Merger, M. T. Sellers, J. M. Orenstein, T. Shimada, M. F. Graham, H. Kubagawa. 2001. Intestinal macrophages lack CD14 and CD89 and consequently are down-regulated for LPS- and IgA-mediated activities. J. Immunol. 167:2651. Rugtveit, J., E. M. Nilsen, A. Bakka, H. Carlsen, P. Brandtzaeg, H. Scott. 1997. Cytokine profiles differ in newly recruited and resident subsets of mucosal macrophages from inflammatory bowel disease. Gastroenterology 112:1493. Radsak, M. P., H. R. Salih, H. G. Rammensee, H. Schild. 2004. Triggering receptor expressed on myeloid cells-1 in neutrophil inflammatory responses: differential regulation of activation and survival. J. Immunol. 172:4956. Bleharski, J. R., V. Kiessler, C. Buonsanti, P. A. Sieling, S. Stenger, M. Colonna, R. L. Modlin. 2003. A role for triggering receptor expressed on myeloid cells-1 in host defense during the early-induced and adaptive phases of the immune response. J. Immunol. 170:3812. Nochi, H., N. Aoki, K. Oikawa, M. Yanai, Y. Takiyama, Y. Atsuta, H. Kobayashi, K. Sato, M. Tateno, T. Matsuno, et al 2003. Modulation of hepatic granulomatous responses by transgene expression of DAP12 or TREM-1-Ig molecules. Am. J. Pathol. 162:1191. Reterink, T. J., E. W. Levarht, N. Klar-Mohamad, L. A. Van Es, M. R. Daha. 1996. Transforming growth factor-β1 (TGF-β1) down-regulates IgA Fc-receptor (CD89) expression on human monocytes. Clin. Exp. Immunol. 103:161.